We can customize our Hollywood private tour fit your interests and budget. Great for families with kids and senior citizens. Including transportation and transfers. This year Farmers market celebrated 75-th anniversary. 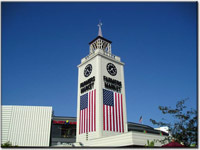 Farmers Market remains one of the city’s most popular destinations, offering over 100 shops, restaurants, grocers. We invite you to join our tour and discover the place where folks have been coming to their senses for the past 75 years. Call 1-800-761-1775 or e-mail: info@latraveltours.com for more info. Visit Los Angeles and become a part of Entertainment Capital of the World. There are few cities that offer as much entertainment, excitement and diversity as do the attractions in Los Angeles. Los Angeles past and present come alive as you tour the City of Angels.